Sometimes the Universe has to step in and let you know when you are getting a little too big for your britches. I have apparently had to be reminded of that fact a few times over the last couple of days. The medallion has proved to be a challenge that I am not ready to give up on (yet) but has certainly brought me down a peg or two. To begin this portion you need to cast on some stitches before picking up on one side, knitting across the bottom and picking up on the last. 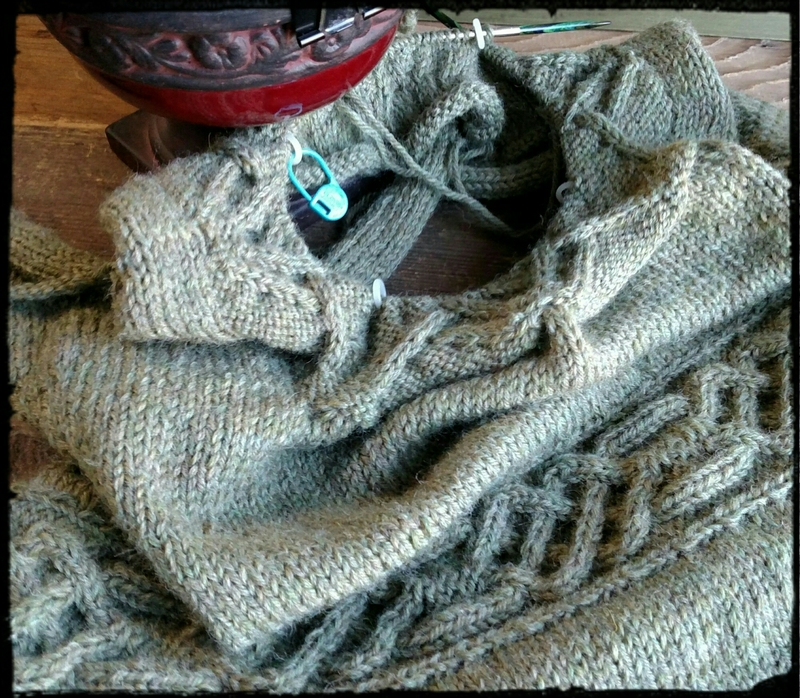 While done ‘in-the-round’ it ends up being a square pattern with 4 cable design repeats. The concept is simple. But for me the challenge started with picking up the stitches along the sides. I have concluded that the difficulty is a result of my technique in ending one row and starting another. Because no matter how many times I try I am unable to locate the bars that should be there in the center of the ‘V’ in the knit stitch. I should probably go back a bit and let you know that I am a self taught knitter and began in the days before You Tube and how-to videos that are now abundant on the web. I have an aunt that is very proficient and probably would have been happy to instruct me but I never asked. I have watched dozens of knitting videos and my technique is nothing like anyone else’s I have found. So my last row is not the neat column of knitted V’s that I see in all the videos and pictures. And until recently when I had a new found interest in gaining skill I had not done much more than scarves and hats so it rarely came up that I ever had to pick up stitches. And as it turns out, on those first projects, I was doing it entirely incorrectly by picking up the shoulder of the last stitch. It was messy and inconsistent and I always wondered why it was so difficult. It wasn’t until after I knit my first pair of socks that it occurred to me that I may have been doing it wrong. But I still can’t manage to pick up in the first row as I should be able to! See the bottom edge of the cabled strip in the picture above? The top and bottom row is supposed to be 2 stitches wide, the same as the cables. Instead I lost a row when completing the pick ups. It looks fine and is still in proportion and it was made up with an extra row above and below in the lenght. But it would be nice it could have been as intended. It becomes a bigger problem with the medallion though. Because it means I lose width in the shoulder which I will have to make up for in decreases. And it also means that the transition to the medallion pattern is not as clean. I won’t really know how it looks until the pattern is decreased enough to move to DPNs. Right now, a square pattern being knit with circular needles, it is a bit puckered and isn’t laying flat. Enter potential problem #2. 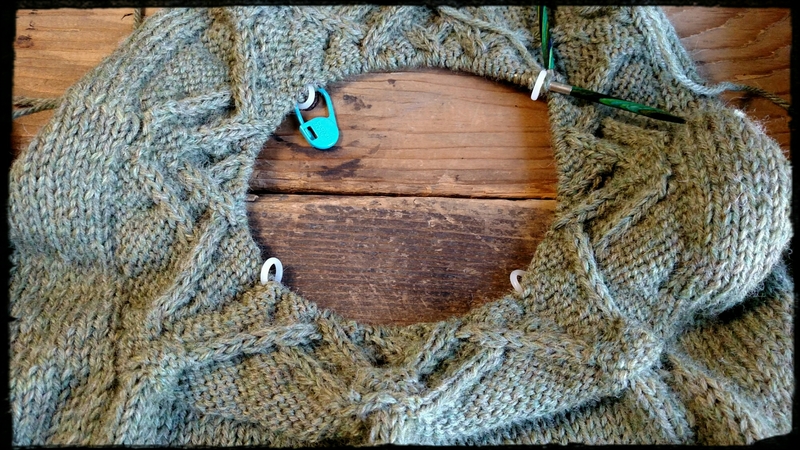 After reading several pattern reviews on Ravelry I had determined that the medallion needed to be knit with needles a couple of sizes smaller, otherwise it had a tendency to bulge rather than lie flat. As it is beginning to take shape I am now second guessing my decision. I had knit the cable design for the waistband 1 size smaller. Perhaps that is as much as I should have decreased for the medallion as well, but for now it is still too early to tell. So here I am , a week after knitting that first row for the medallion section and I had only successfully completed 11 rows. Yesterday, Saturday, I finished 2 more before seeing a mistake – problem # 3. A cable that was leaning the wrong direction. Silly over-confident me, I thought I could just knit up to it, drop the stitches, pick them back up and reverse the direction of the cable. An hour later I was still trying to correct my correction. I had to go back 2 full rows – not so easy with cabling. At the end of the day I only made it to row 14. Ugh! I do anticipate that the rows will start going faster as there are decreases EOR. But I have a sinking suspicion that it will have been for naught and I will have to end up frogging the whole section and starting again.